Lisa Kamarchik graduated from Illinois State University in 2000 with a B.S. in Psychology and minor in Criminal Justice. She obtained her J.D. degree from North Carolina Central University’s School of Law evening program in 2006 while working as a paralegal at a large law firm. Ms. Kamarchik is a member of the North Carolina Bar Association, Wake County Bar Association, and Tenth Judicial District Bar. For a number of years, Ms. Kamarchik limited her practice to family law and family law appeals. 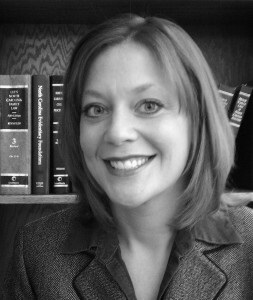 She is a Board Certified Family Law Specialist. In 2013, Ms. Kamarchik received the Charles F. Blanchard Young Lawyer of the Year Award for outstanding volunteer service in the North Carolina Bar Association Young Lawyers Division. She chaired the YLD Domestic Issues Committee between 2009-2011, acted as a YLD Division Director between 2012-2014, and published multiple articles in the Family Forum newsletter. Ms. Kamarchik enjoys legal research and writing, and one of her articles dealing with the admissibility of expert testimony has been published in the North Carolina Central University Law Review. In addition to adjunct teaching, Ms. Kamarchik has discussed family law topics at Continuing Legal Education programs.